Why Do I Need Outdoor Accent Lighting? Let’s say you are hosting an outdoor dinner party for family and friends, and they are enjoying the summertime with the beautiful outdoor accent lighting in your backyard. Or maybe you are coming home from a long day at the office and pulling your car into your driveway. Most of the homes around you are dark, but you are comforted walking to your front door, admiring the architectural beauty of your home as it is washed in soft, artistically placed lights. Architects, builders, and homeowners know the value of a home that is awash in subtle, beautiful light at night. But where do you start? Our lighting team at American National have decades of experience in figuring out the right light in just the right spot to give you a magical environment that you can enjoy all year long. Here in our area, outdoor accent lighting is never more important than in the summertime, as we enjoy beautiful evenings out in the backyard with friends and family. The exterior of your home can be dramatically enhanced by architectural lighting. 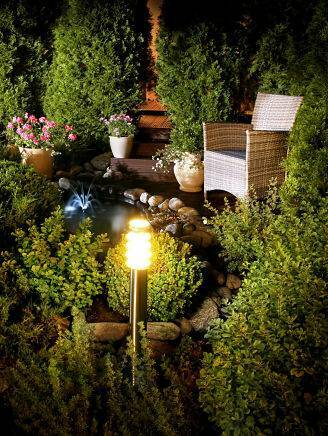 It can work with landscape lighting to create a beautiful ambience. Lighting trees is a dramatic step toward creating a beautiful space. There are different techniques for illuminating trees, which will create interest all twelve months of the year. One option is to install lighting at the base of the tree, which shoots up along the trunk. The technique is particularly effective in illuminating a tree’s canopy, as well as highlighting an interesting bark along the trunk of a tree. We can also put lights up in the tree shining down, giving a softer, diffused light to your property. Using both can give you a gorgeous, dramatic ambiance to your outdoor space, whether in the front or back yard. Our lighting experts at American National can work with you to strategically place lights in order to create a vision at nighttime of greater space and beauty. Using our experts to light your bushes is both an art and a science. Strategically placed lights on bushes can truly define the depth and the interest of your property. It may be lighting along a pathway, where smaller bushes are highlighted for people walking to your front door. Or maybe you have substantial, larger bushes near the side of your home. 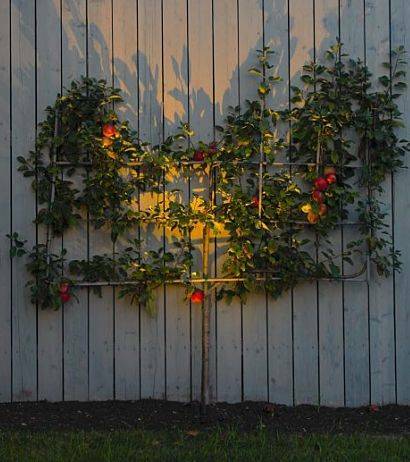 In that case, lighting a bush from behind, next to the side of your home, can augment the look and feel of the space, giving it beauty and drama. You may have a part of your home that is architecturally beautiful. Sometimes it may be a stone wall, or stacked limestone, or an offset brick wall. The right light in the ground shining up on the area can showcase it. Maybe you have a lovely address on the side of your home, or on your mailbox. Beautifully lighting it provides elegance to your property. It also provides safety. Imagine the time saved if emergency crews should need to find your home quickly. Lighting from American National will help lead the way. Sometimes we will have a focal point in our front or back yard. It may be a treasured statue, or bubbling fountain. With good lighting, we can highlight the focal points so that they are not forgotten when the sun goes down. 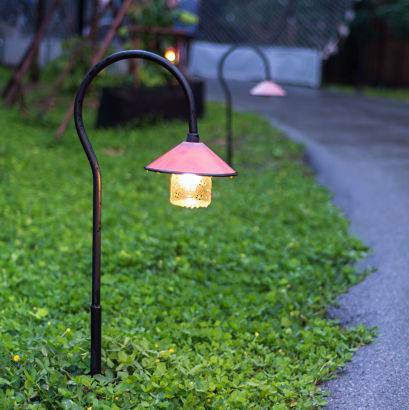 In fact, they can be a highlight of the outdoor space with the right outdoor accent lighting. When you have beautiful outdoor accent lighting, there is an additional benefit other than aesthetics. Outdoor accent lighting provides safety for you and your family. Strategically placed lighting can direct people along the driveway and pathways to get them safely to your front door. For example, there are a variety of lanterns that are both beautiful and functional, that cast circles of light at just the right locations in order to illuminate your pathway. There is also a security reason to have outdoor accent lighting. When your home is illuminated at night, and you walk the steps into your home, you can see no one is approaching or hiding by the front door. Would-be intruders are discouraged from targeting homes that are well lit. You do not want flood lights in your eyes, but rather security and beauty. Our experienced team at American National can help you achieve both objectives within your budget. Studies have shown that investing in an outdoor accent lighting plan is money well-spent. Not only does it give you great pride and enjoyment, but should you ever need to move, this added benefit can help the resale value of the home. It can set your home apart from others in the area, which can be a huge benefit should you need to sell. These kinds of dramatic changes to the exterior of your home do not happen by accident. To create this transformation, it requires participation and the years of experience of our team of experts at American National who can take a space and illuminate it into something truly wonderful. From security concerns to ambience, our staff has the detailed knowledge to make your dreams come true. We pride ourselves on being professional, getting the project done on time and under budget. We carefully listen to you so we can put your vision in motion and create a wonderful oasis for you. Contact us so we can work with you to create an enchanting environment outdoors that you can enjoy year round!